Videos of iTaSC examples and demonstrations. Click on the images below to see the video. 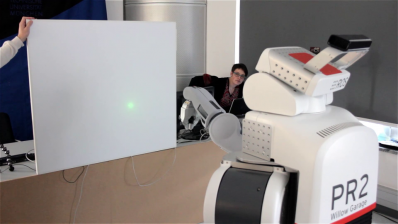 This application uses the tasks from the laser tracing demo with the KUKA youBot (ERF2012), together with the joint limit avoidance task of the co-manipulation demo (IROS 2011/SYROCO 2012), executed on the PR2.